The earliest church on the site of St. Andrew’s is thought to have been Saxon. It would probably have been built of timber and demolished completely in order to build a stone church. The present church is thought to date from around Norman times (about 1120) although very little now remains. To the Norman chancel, nave and south aisle was added the west tower, which probably included a spire, at about the beginning of the fourteenth century. Later in the same century the north and south chancel chapels (now the clergy vestry and Lady chapel, respectively) were built. 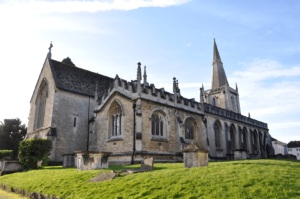 In 1442 the south chancel chapel and the upper parts of the tower and spire were rebuilt, thanks to Walter Lord Hungerford, then lord of the manor, whose coat of arms was included on the exterior of the west wall and whose name also lives on in the town’s Hungerford Road. This was soon to be followed by the addition of the south nave chapel (now in use as a baptistry) in 1485. However, by 1633 there were signs of collapse so the tower and spire, except for the tower base stage, had to be taken down and rebuilt again, the height being reduced by 15 feet (4.6 metres). Incorporated into the rebuild was an additional coat of arms commemorating Sir Francis Popham who contributed 40 to the total cost of 320 and who is also remembered in the road named Popham Court. The north wall of the nave was rebuilt at least twice, in 1655 and again in 1801. During the eighteenth century flat ceilings were inserted but these were removed during a complete restoration in 1875-78 under the direction of local architects, Messrs. John and Richard Darley. At this time the chancel was largely rebuilt and extended 20 feet (6.1 metres) to the east, including a replacement clergy vestry; a lofty chancel arch replaced the low Norman one which was relocated to the south side of the clergy vestry; a clerestory was added to the nave, and the north aisle and organ chamber were built. Also at this time repairs to roof and walls were carried out. In 1907 the south nave chapel was refurbished as a baptistry and the choir vestry was added.